Gaiman had Adams’ full cooperation. “Douglas Adams opened his address book to me. I talked to his colleagues, and went through his filing cabinets. I read dozens of scripts and photocopied all of Douglas’s press clippings. I played the Hitchhiker’s computer game to the end, and battled with primitive word processing programs trying to find one that would let me do footnotes. My favourite bits were interviewing Douglas, though, and the way he’d manage to be funny, and serious, and faintly baffled, all at the same time.” (p. ix) The original book ran 23 chapters, now the first 170 or so pages of text. It has been updated three times; David K. Dickson added three chapters in 1993, M.J. Simpson added four in 2002 and “overhauled the entire text” (p. x), and Guy Adams adding another eight chapters in 2009. The germ of the idea was the parallel between the demolition of an everyman’s house and the simultaneous demolition of the earth. Adam’s initial idea was for a series of shows, each dealing with the destruction of the earth for different reasons. “It was going to be called The Ends of the Earth. It’s still not a bad idea,” [said Adams]. “But it was while I was tinkering with the story idea for the first one that I thought, to give the story perspective there really ought to be somebody on Earth who is an alien and who knows what’s going on. Adams lucked into a nearly perfect producer with Geoffrey Perkins. “The show was something very different. In the past (and today, for that matter) as a rule a radio comedy show is rehearsed in an afternoon, recorded in front of an audience that evening, then edited the following day before being broadcast. Not only was Hitchhiker’s not recorded in front of an audience … it was put together with almost lapidary detail, using (albeit in a somewhat Heath Robinson fashion) the miracles of the BBC Radiophonic Workshop, lots of tape, and scissors.” (p. 34) They took enormous care with the sound effects, they invented processes as they went along, and they snagged so much additional working time here and there and everywhere that it’s a good thing the powers that be never quite noticed. “The BBC were unsure what they had on their hands: a comedy without a studio audience … the first radio science fiction serial since Journey into Space in the 1950s, half an hour of semantic and philosophical jokes about the meaning of life and ear-inserted fish? They did the only decent thing and put it on at 10:30 on Wednesday evenings, when they hoped nobody would be listening, with no pre-publicity, and expected it to uphold Radio 4’s reputation for obscurity. “They were undoubtedly surprised when it didn’t. After the first episode was broadcast, Douglas went into the BBC to look at the reviews. It was pointed out to him that radio almost never got reviews, and that an unpublicised science fiction comedy series was less likely to get reviews than the shipping forecast. That Sunday, two national newspapers carried favourable reviews of the first show, to the amazement of everybody except Douglas and the listeners. “The series rapidly began to pick up a following, accumulating an enormous audience chiefly by word of mouth … most people liked it because it was accessible, fast, and funny. Those six episodes set the stage for everything that followed. Gaiman covers the more than slightly manic phase when Adams was writing and producing for Doctor Who, writing the first Hitchhiker’s book, and also writing the next six episodes of the radio series. He had taken on the Who commitments before anyone realized that Hitchhiker’s would be huge, and he couldn’t back out immediately. Demand for the book was insistent, and because he was writing for a paperback house, the kinds of delays he later became known for were not an option. From there, Don’t Panic follows Adams’ work as he extends the Hitchhiker’s stories, translates — or in the case of film, attempts to translate — that universe into various different media, and the other projects that he pursues. These range from The Meaning of Liff to Dirk Gently’s Holistic Detective Agency, to the radio series and book about nearly extinct animals, Last Chance to See. Adams died of a sudden heart attack in May 2001 at the age of 49. 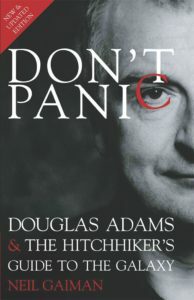 Don’t Panic contains tributes to Adams, as well as the continuation of Hitchhiker’s even after the end of its creator’s life. A movie finally appeared in 2005. Radio adaptations of the third, fourth and fifth novels in the Hitchhiker’s trilogy were broadcast in 2004 and 2005. In 2005 an asteroid was named for Adams. The fall of 2019 will mark the 40th anniversary of the publication of the first Hitchhiker’s book. It’s still an enormous influence in the field and is drawing in new generations of fans, successfully competing with manga and memes well into the twenty-first century. 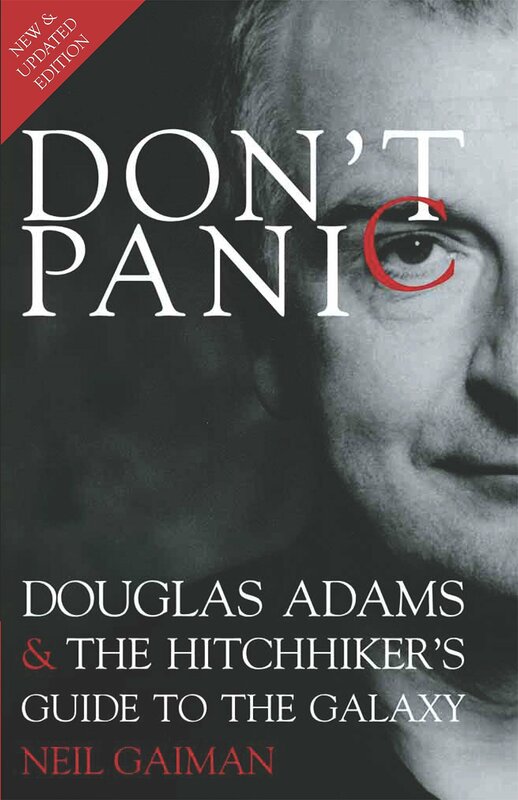 Don’t Panic is an enjoyable, if generally slight, tour of how that wholly remarkable phenomenon came into existence, with some bits about its creator’s life, and the things he worked on besides Hitchhiker’s.